What is the Forest Committee? A California Non-Profit Public Benefit Corporation, founded in 2003 by a coalition of private citizens and public agencies including the CCSD, Cambria Fire, SLO County and Cal Fire. What does the Forest Committee do? 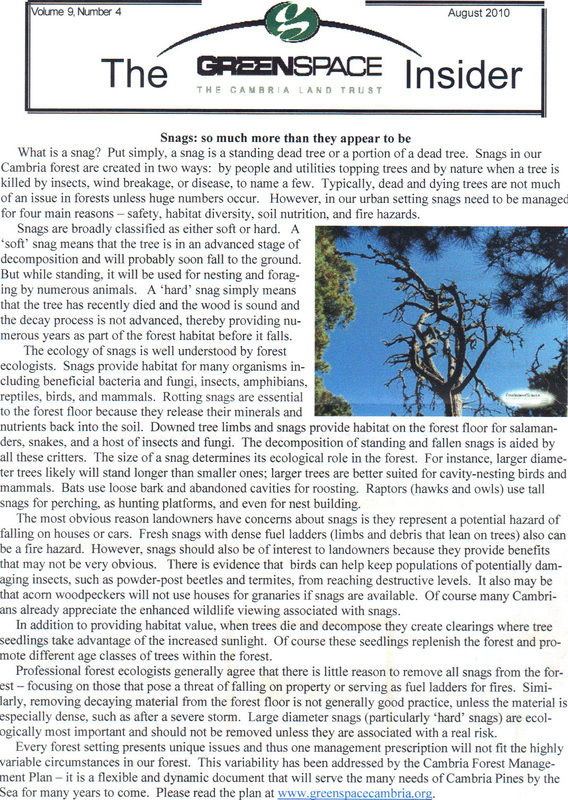 The Forest Committee acts as a forum to discuss, plan and implement projects to maintain a healthy and safe Monterey Pine forest in Cambria. When does the Forest Committee hold meetings? Our meetings are on the second Wednesday of each month at 6:30 PM in the Cambria Rabobank meeting room. Our meetings are open to the public. We begin each meeting with a question and answer session on anything related to trees, weed abatement and fire-risk reduction. · Publishing curriculum, Investigating the Oak Community, which COF donated to most libraries and middle schools throughout the state. · Issuing a free monthly newsletter, the Oak Report, explaining carbon sequestration, citing California law, giving pointers on how citizens can educate themselves about the law, and many other topics. · Authoring two publications, Oaks 2040, The Status and Future of Oaks In California, and Oaks 2040, Carbon Resources in California Oak Woodlands so that Californians can recognize the value of these important resources. · Made several oak-related books available as free downloads; Acorns and Eat ‘em, Compatible Plants Under and Around Oaks, Investigating the Oak Community, Regenerating Rangeland Oaks in California and A Field Guide to Insects and Diseases of California Oaks. · Provided links on our website to; current information on SOD and goldspotted oak borer; county oak-woodland policies (the last line of each has a link to the county planner or other department responsible for oak policy enforcement); a wealth of information from the state’s experts at the Fifth Symposium on Oak Woodlands; maps and photos and more. For ten years, COF ran side-by-side with the California Wildlife Foundation (CWF) also a 501(c)(3) non-profit corporation. With a shared vision of the importance of California oak and wildlife habitat sustainability, in 2010 the two non-profits became one. A fund was established within California Wildlife Foundation called California Oaks. Any donation made to CWF/California Oaks will be designated exclusively for oak projects. We invite you to peruse the California Oaks website where you will find free, downloadable books, oak care pamphlets, links to oak-related websites and much more. We also invite you to visit the California Wildlife Foundation website.